King and Queen at a feast. "A bettre envyned man was no-wher noon. With-oute bake mete was never his hous, of fish and flesh, and that so plenteous, it snewed in his hous of mete and drinke, of alle deyntes that men could thinke. After the sondry seasons of the yeer, so chaunged he his mete and his soper. Ful many a fat partrich hadde he in mewe, and many a breem and many a luce in stewe. Wo was his cook, but-if his sauce were poynaunt and sharp, and redy al his gere. His table dormant in his halle always stood redy covered al the longe day. [A more envied man was nowhere. His house was never without baked meat, with fish and flesh so plentiful that it snowed food and rained drink, and all the dainties you could think of. For the various seasons of the year he changed his meat and his supper. Many a fat partridge had he in the coop, and many a breem and many a pike in the pond. Woe to his cook, unless his sauce was poignant and sharp, and his utensils always ready. His table in the hall always stayed set all the long day.]" At Christmastime, our minds turn to family and friends, and celebrating the holidays with feasting and merriment. And so it was in the Middle Ages, too! 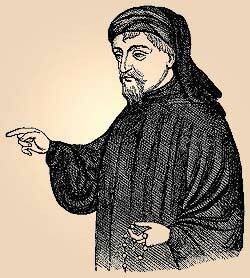 Chaucer's Franklin, whose edibles are described in The Franklin's Prologue from The Canterbury Tales (above), might have thrown a Christmas feast fit for a king and his entire household if Chaucer's description is any hint. But what did feasters eat to celebrate the season in Chaucer's England? 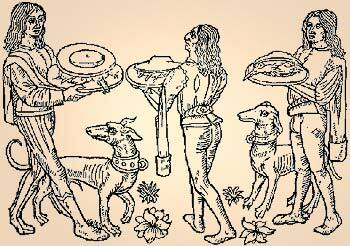 The traditional Christmas dinner that comes to mind now was unknown in the fourteenth century. 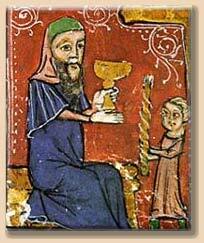 No turkey, no potatoes, and no pumpkin pie — what did they serve at medieval Christmas feasts? The answer is, there wasn't one particular "traditional" menu to celebrate the season—there was just more of everything. 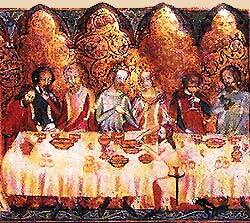 A feast would be served in courses, beginning with bread and cheese, along with a soup or broth. The next course would likely be vegetables and a lean meat dish with sauces, perhaps Blank Mang. The feast would progress from there to heavier and more savory dishes, in decreasing portions, ending with dainties and desserts like plum pudding and mincemeat pie. Wine and ale would be served throughout, perhaps even spiced or mulled (warmed) wine or ale-based drinks like caudell (a frothy drink of spiced wine or ale) or ypocras (a sweetened, aged spiced wine). of The Forme of Cury. Historical account books, handwritten recipe books, and sources like Chaucer give us an idea of some of the things that appeared on medieval tables, at Christmas and all year round. One period recipe source available to us is The Forme of Cury. Scholars believe this medieval cookbook was written at the end of the fourteenth century by the master cooks of Richard II (r. 1377–1399). As such, it is one of the oldest known cookbooks in existence. Cury is a Middle English word for "cookery." At left is an example of one recipe for Blanc Mang, (bluh-mahnj) from which we get our modern word Blancmange (a sweet vanilla cornstarch pudding). The medieval antecedent, which often included chicken or fish, was made with milk and rice and was only sometimes sweetened. Take capons and seeth hem. Thenne take hem up. Take almandes blanched. Grynd hem and alay hem up with the same broth. Cast the mylk in a pot. Waisshe rys and do thereto and lat it seeth. Thanne take brawn of caponns. Teere it small and do thereto. Take white greece, sugar, and salt, and cast thereinne. Lat it seeth. Then mess it forth and florish it with aneys in confyt rede other whyte and with almandes fryed in oyle and serve forth. Grind the almonds with the ice water in a food processor or by hand with mortar and pestle until smooth. Combine heated chicken broth with the ground almonds, and allow to stand for about 10 minutes, stirring occasionally. Put the almond broth into a pan, add the rice, salt, butter, and sugar. Cook covered for 20 minutes or until the rice is nearly done. Add the diced chicken and continue cooking until the rice is done. Just before serving, garnish with the toasted almonds and candied anise seed. Serves 4.
was heated with a hot poker. Whatever you serve at your Yuletide feast, a nice, warm drink is definitely a necessary part of the festivities. 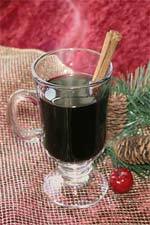 For winter, there is nothing as warming as a mulled, spiced wine. Originally, mulling was a term for warming the spiced wine with a poker heated in the fire, although nowadays a pot on the stove will do. Mulling was done with all sorts of wine, spiced or not. For the holidays, warm spiced wine was an anticipated treat. Potus ypocras. Take a half lb. of canel tried; of gyngyuer tried, a half lb. ; of greynes, iii unce; of longe peper, iii unce; of clowis, ii unce; of notemugges, ii unce & a half; of carewey, ii unce; of spikenard, a half unce; of galyngale, ii unce; of sugir, ii lb. Si deficiat sugir, take a potel of honey. The spices named are cinnamon, ginger, cardamom, white pepper, cloves, nutmeg, caraway, spikenard (a relative of the herb valerian, which has sedative properties and is not recommended for use in cooking today—besides which, the flavor leaves much to be desired) and galingale (a seasoning made from cypress root). After boiling the wine and spices, the mixture was left to sit overnight to settle and steep. Then it was strained through cheesecloth. Once it had aged properly, it could be served as one would serve wine, used as a sop for bread, or it could be mulled for a hot Yuletide treat. If you have made ypocras (modern recipe below), then you have the basis for mulled wine, and you may simply warm the drink in a mug in the microwave for 90 seconds before serving it. If you don't have your ypocras made and and ready by Christmas (which I rarely do) you can make mulled wine by using the same recipe, and straining and serving the hot wine as soon as it has cooled enough to drink. Pour the wine into a large pot and add honey (or sugar). Bring to a boil. If you are using honey, make sure to skim off the scum as it rises. Add the spices, adjusting for taste and adding more sweetening if necessary. Remove the pot from the stove and let it sit for 24 hours, to let the spices settle to the bottom and steep. Strain the ypocras by ladling the wine through cheesecloth into a pitcher that you can cover, as it is best served when it has been aged for at least one month. Use the same ingredients and follow the instructions for ypocras, above. Strain through multiple layers of cheesecloth. Serve warm and garnish each cup with a stick of cinnamon or a slice of lemon. Non-alcoholic version: Substitute non-carbonated white or red grape juice for the wine. Cut the spices down to a teaspoon each, use about ½ to 1 cup honey or sugar depending on how sweet the grape juice is, and add 2 tablespoons of lemon juice to give it some kick. Happy holidays from The Renaissance Store, and may all your festivities warm your heart! If you want to add this article to your list of favorites or email it to a friend, please use this permanent URL, https://stores.renstore.com/-strse-template/0712B/Page.bok. Permission is granted by the author to quote from this page or use it in handouts as long as you include a link back to Renstore.com.